The February 2019 release of CoreRelate applications (MatterLink Docket Enterprise, Assemble-It and LegalBar) is now available. Visit the download page to access the package and detailed release notes (for this release and cumulative.) Valid login credentials are required. The release includes a small set of Docket Enterprise, data importer, and other bug fixes, along with File Stamp enhancements. What’s New? File Stamp Features! This month, the release emphasizes our LegalBar File Stamp application, which has been enhanced with important new features. File Stamp inserts document id information into your documents automatically on save (or via manual insert of a stamp.) It is equipped with a full range of placement options and is very flexible for formatting the stamps themselves. File Stamp is integrated with both NetDocuments and iManage document management systems. A new administrative option lets you initiate upgrade of .doc files to .docx as they are opened, with an additional option to either display a confirmation prompt every time or do the upgrade automatically. This is a convenient way to bring your old documents into the preferred .docx format. File Stamp now stamps .doc file format documents with a Word field code and a supporting document property to populate the field code. 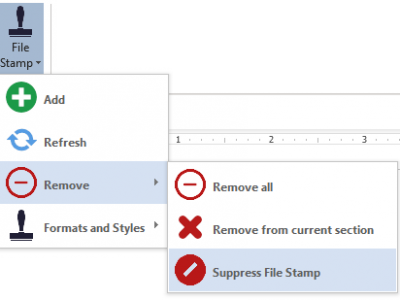 All file stamp functionality is supported with the new stamping method with both iManage and NetDocuments document management systems. This includes automatic stamping, placement options, and file stamp format features. This change provides reliable stamping for .doc files, without forcing upgrade to .docx. And one more small enhancement…the “suppress” feature, which was part of the November 2018 release, now removes any existing stamps in the document along with suppressing future stamp inserts. Please contact us at info@beclegal.com if you would like to know more about LegalBar File Stamp. As always, email support@beclegal.com with questions about upgrading to the latest release.